Due for release from the Wonderland Records import label is 4 CD the longbox entitled "And Now The End Is Near". Fifteen bonus tracks, fourteen by Elvis Presley from March 26, 27, April 25, 29, 30 and May 2, 3 and one by Sherill Nielsen (Walk With Me", recorded March 30) . for goodness sake, look at the cover- no one should take a release like this seriously..
Well, I happen to love 1977-Elvis. Much more than him "at his (Las Vegas-)peak" in 1970. The St. Petersburg, FL. Feb. 14th gig is actually very good. Agree with Ciscoking though. This is a copy/paste-job. 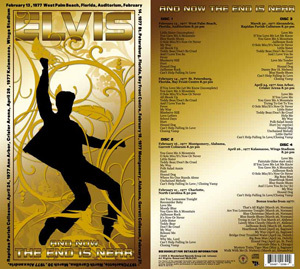 My Ftd spring tours and Elvis in concert cd are good enough for me when it comes to Elvis 77! For starters it means something different..than for die hard collectors..
elvis sweden...it`s o.k. for starters when they don`t have the chance to get the orginals....that`s what I meant..this means this C-R-A-P is a little bit more worth than nothing.. Doesn't matter which part of 77 the shows come from - all 77 shows reveal that Elvis was way past his best. Only those in denial think otherwise. But if listening to a forgetful, bloated, bored once great showman is your idea of fun, then... Just because it's Elvis doesn't make it good. Far from it. This stinks more than the fish I am now cooking. Well Mr.Ciscoking I haven't been available to talk to the guys involved in this wonderland records and also not the guys that tour No 14 was stolen from.Good to have you mentioned it for us rest that are knowing things we don't :-) But somehow you are talking with a split tongue first to stay away of buying this crap etc.. and then it's ok for starters?? ?Why not stay away of buying this crap at first place then???? Err,..you know their latest crime..by accident..? Tour No.14...with 14 shows... all stolen from somewhere else....just like in this very case. Most will have the originals anyway....so for starters only.. Grab some old bootlegs from the attic and put it together in a lousy box, golddigging or what? Actually if i had a loved one who was sick,id not want them on stage in bad condition,this did nothing for his health,comparing our loved one and Elvis is a bit strange to me,its not putting Elvis down its just stating the facts,he needed help,both mentally & health wise! I agree that this is a downer & I would not buy it. But to say he should not have been on stage is like saying we should not look at our loved ones before they go. It was painful but I don't carry the memories of how he looked in April 1977 (still wouldn't have kicked him out of bed) but I do carry the wonderful memory of how he sounded, especially when he sang "Hurt" & that wonderful voice came through. Enough said. 1977 material is not my favourite, but no matter what I am listening to, I try to keep in mind where Elvis was in his life and use the material to develop a more well-rounded sense of who he really was as an entertainer and, more importantly, as a human being. Having said that, the title alone of this release is a definite downer, and judging from the information given, it is highly unlikely that it is something that I will purchase, now or ever. I'd rather hear Elvis in the mid-60's than this. At least I know he was healthy then and still had it. Elvis in 1977 is depressing to me. He is in terrible condition, showing no interest in new material, has difficulty breathing, remembering & getting through his shows. He just should have not been on stage period. How anyone can want multiple shows from this time is beyond me. This is the kind of stuff Elvis haters love to see released. Still I'd rather listen to Elvis live 1977 than Elvis mid 60's movie songs. You have to be a masochist to buy Elvis 1977 concerts! In 1977 the end wasn't near. Unfortunately it had already arrived! As usual with all there previous releases sound quality is excellent,but there is nothing New here and i bet it will 'LIMITED EDITION to 500 copies? ?.Not sure why they have decided to use a ELVIS 50's pose instead of a later 70's pose,but then again they did use a picture fron Aloha on the last box set and called it 70's part 1 and used material was from TTWII??. So for those who want this material it may be of use to you for everyone else this is just another re-re-release of imports long been and gone. well the cover betrays that this an amateurish coopy and paste job.. I wouldn't know about the sound but it sure is an awful cover! An Elvis 50's pose on a late 70's content?! He sure looked different than that in 1977!